In this section I reflect on my experience of co-chairing the OER16 Conference and communicating and working with the conference committee. In 2016 I had the honour of co-chairing the OER16 Open Culture Conference , a task that involved coordinating, communicating and working with a large number of international peers and colleagues. 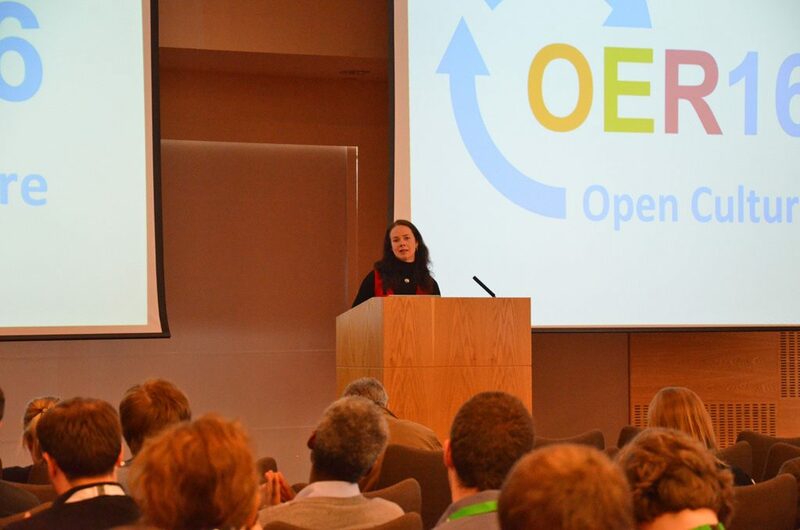 OER16, the 7th international OER conference, ran over two days at the University of Edinburgh and was facilitated by ALT. The event attracted a large international audience of 160 delegates and 100 speakers from 29 different countries. 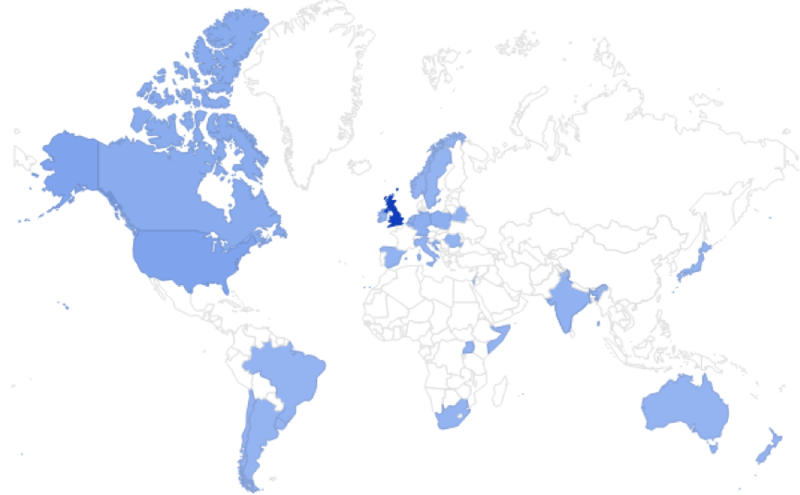 Location of OER16 speakers. CC BY Martin Hawksey, ALT. As co-chair, along with my colleague Melissa Highton, my role was to set the theme of the conference, identify keynotes, and liaise with the ALT team. In addition, I took the lead in coordinating the conference committee  which was composed of 40 individuals from a range of educational sectors around the world. With input from committee members, I was responsible for facilitating the committee mailing list, chairing monthly committee calls, liaising with ALT, coordinating the peer review and selection of papers, evaluating applications for assisted places, planning the social programme and dealing with occasional logistical issues. I also promoted and raised awareness of the conference through numerous talks , webinars  and blog posts  on both my own Open World blog and the conference blog, and wrote an article about the conference for the Ariadne online journal . In addition, I made extensive use of the #OER16 hashtag and contributed to many discussions around the conference themes. In order to organise the conference committee my colleagues and I used a wide range of communication technologies. The committee mailing list was our main channel for ongoing communication and updates, monthly committee calls were facilitated through Collaborate, which was also used to host webinars. I used Skype and Google Hangouts for calls with smaller groups and sub-committees. The OCS system was used to facilitate peer-review of conference submissions, a task that was coordinated by ALT. I led a small team of three volunteers who selected the papers on the basis of the peer reviews and drafted the programme. In order to managed this task we used Google Drive to share spreadsheets and documents. Although I routinely use a wide range of social media to amplify conferences I attend (see 1c Supporting Deployment of Learning Technologies), as I was co-chairing OER16 I had little time to communicate and disseminate the conference while the event was actually running. Afterwards however I wrote a series of blog posts  summarising and reflecting on the event and thanking all those who had volunteered their time and effort to make it such a success. Lorna Campbell opening the OER16 Conference, CC BY SA Anna Page. For most of my career as a learning technologist, I have worked as part of a distributed team. This has meant working remotely from my colleagues who may be located around the UK or internationally. In order to do this I have made use of a wide range of communication and social media technologies (see 1b Technical Knowledge and Ability) and remote working is now second nature to me. I have also developed extensive experience of managing and coordinating distributed project teams (e.g. the Repositories Research Team  which had staff around the UK, and the Learning Resource Metadata Initiative , which involved a team of people in the US and the UK). This has often meant facilitating communication across multiple time zones. This experience stood me in good stead when I co-chaired OER16. I thoroughly enjoyed the experience of working with a diverse group of colleagues from around the world, and I found it relatively straightforward to manage the numerous communication channels we used to plan the conference and to coordinate all the different strands of activities. The exemplary support provided by the ALT team helped enormously in this regard. One aspect of working with the OER16 conference committee that differed significantly from previous distributed teams I have worked with is that all members of the conference committee were volunteers. Some were academics and learning technologists who contributed their time on top of their day jobs, others were early career researchers, some were retired or unemployed. The committee members also had a wide range of experience; some had extensive experience of planning and co-chairing conferences and contributing to conference committees, others were entirely new to the experience. This meant I had to be careful that I was communicating at the right level depending on who I was talking to, in order to make sure that everyone knew what was expected of them. Managing volunteers requires slightly different skills and sensitivities to line managing colleagues within an institution or project team, particularly when there are tight time scales and deadlines involved. Engaging and encouraging committee members is crucial and simply telling people to do things is neither helpful or appropriate. I felt it was important not to take committee members’ contributions for granted, to be sensitive to colleagues other responsibilities and commitments, and to make sure they were aware of how much I appreciated the time they devoted to the OER16 Conference. In one of my first blog posts following the conference , I made a point of acknowledging the input of the everyone who volunteered their time and energy and thanking them for their contribution. 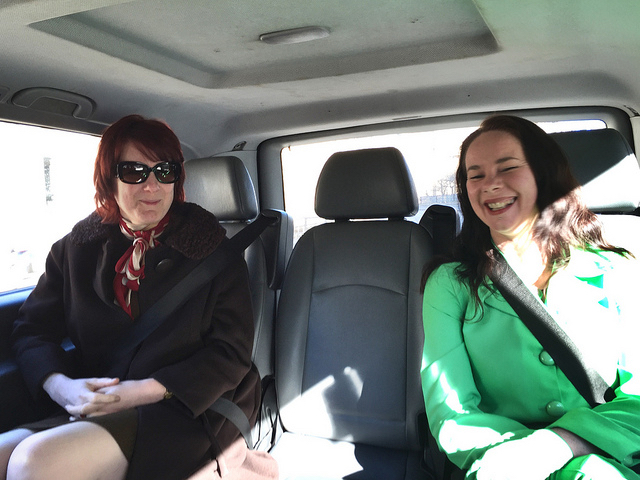 “So, the OER16 Open Culture Conference has been and gone and what an experience it was! Co-chairing OER16 with my inspiring colleague Melissa Highton has been an enormously rewarding experience and I owe a huge debt of thanks to everyone who volunteered their time, effort and creativity to make the conference such a success. In particular I’d like to thank our keynotes, Catherine Cronin, Emma Smith, John Scally, Jim Groom and Melissa Highton for their inspiring and thought provoking talks and, of course, the ALT team for supporting the conference and ensuring everything ran like clockwork. I can highly recommend chairing an ALT conference if you’re ever thinking about it!